While Earth Day emphasis concludes at the end of April, Camp Blanding remains committed throughout the year to ensure an effective environmental program. 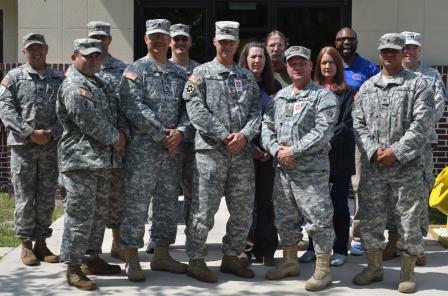 One of the key elements of the successful program is Camp Blanding Joint Training Center’s range control. While the environmental section itself receives special highlights for their award-winning program at Camp Blanding, Jerry Kerce, environmental specialist, states special recognition also goes to range control. Camp Blanding’s Range Control staff provide a wide range of services in support of the Entomological Research Projects conducted by Navy Entomology Center for Excellence, United State Department of Agriculture (CMAVES), Centers for Disease Control and Prevention, Atlanta, University of Florida, and Clemson University on Camp Blanding Joint Training Center during the past three years. Services included communication, training, scheduling, and air space authorization and monitoring, and on ground briefings and safety support. The work of range control ensures training and range areas are operated in a safe, professional manner, which includes effective environmental controls. Range control works closely with the environmental section and actively oversees all organizations using the approximately 72,000 acres at Camp Blanding. One of the key award-winning projects conducted by the environmental section and range control involves safe procedures for pesticide fogging. Camp Blanding provides an unparalleled opportunity to perform aerial tests in a highly-controlled and repeatable environment to collect data that could result in a substantial leap forward in reducing disease risk for U.S. deployed military personnel and civilian populations. Recent testing was expanded to include equipment that would automatically spray ground protective barriers such as HESCO blocks at pre-selected intervals when insects were the most active. “This innovative protocol will eliminate human error, while minimizing safety concerns,” explained Kerce. Additionally, the training center has also joined forces with the Walter Reed Army Institute of Research to test treatment practices for HESCO blocks and plywood panels using novel combinations of spraying equipment and pesticides to determine ideal efficacy in an urban environment. Environmental conservation has long been a strong tradition of this 73,000-acre military training post located in northeast Florida. The installation boasts a wealth of diverse and rare wildlife, so all prospective projects are reviewed for compatibility with environmental goals. By conducting tests on the kinds of construction materials in the field under realistic, natural conditions, Camp Blanding and its partners are vastly changing the landscape for simplifying pest management practices. Several projects also have potential for widespread implementation, such as testing novel treatment methodologies for controlling or eliminating bed bugs in military billeting and buildings.